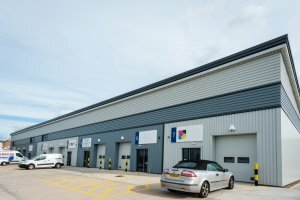 The Enterprise Centre, a 10,000 sq ft speculative development aimed at SME's, is situated within the centre of Optimus Point, a prime commercial development site located strategically adjacent to Junction 21 of the M1 motorway and A46 dual carriageway. With direct access to the main roads, the site is just north of Leicester City Centre and provides excellent access to Leicester and the surrounds. Newly constructed terrace of 7 industrial units of conventional portal frame construction with insulation cladding systems under a mono pitched roof providing excellent thermal efficiencies. Each unit is constructed to a haunch height of 6m and provides clear space internally and benefits from a roller shutter door access. The level access doors have a clear opening size of 2.7m wide x 3m high. Each unit benefits from allocated parking spaces together with a communal yard with ample manoeuvrability for delivery vehicles. A W/C and kitchenette is also provided and in Units 1-3 there is an additional first floor mezzanine (height to mezzanine 3.57m).